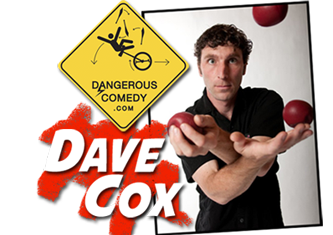 Dangerous Comedy is an original show by Dave Cox, the inventor of the world's only "Toilet Paper Tightrope". With help from the audience, a roll of ordinary toilet paper is transformed into a rope strong enough to support the weight of a semi-grown man. Watch in disbelief as he walks on this anomaly. During the show Dave Cox will also prove he's not like everyone else and will put his pants on both legs at the same time.